Orsogril is available in several panels that are good for stadiums. 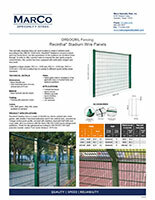 Recintha Staduim is a top fencing option. 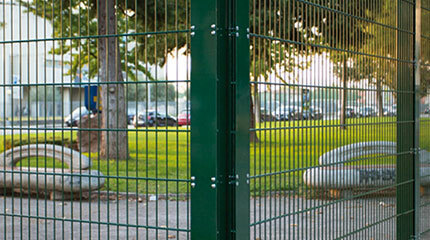 This specially designed fence for sport location is made in welded mesh according to the UNI EN 13200 norm. Recintha® Stadium is not just a robust and very sturdy fence, but also guarantees to the audience an excellent vision through. In order to offer a product able to respond the new sports projects characteristics, this system has been equipped with particularly elegant and nice posts. Available in three models: RS1 H = 2230 mm; RS2 H = 2430 mm; RS3 H = 2230 mm + 630 mm (cranked top) to comply to different sports facility areas standards. 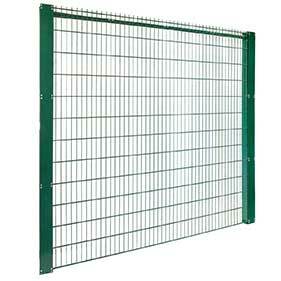 Gates: Safety gates built in compliance of the applicable laws on football fields and stadiums partitions. Recintha® Stadium fence is made of 50×200 mm electro-welded wire mesh panels, with double 8 mm horizontal wires and 6 mm vertical ones, mounted on Omega section posts profile, secured with stainless steel anti-theft bolts and cover plate, all in accordance with the Norm UNI EN 13200 (sports playgrounds partitions). Finish hot-dip galvanized according to UNI EN ISO 1461 and polyester powder coated. Post centers distance: 2570 mm. Contact Marco Specialty Steel today to learn more about Orsogril Recintha® Stadium Panel product options. We’ll also be happy to provide a no-obligation quote.